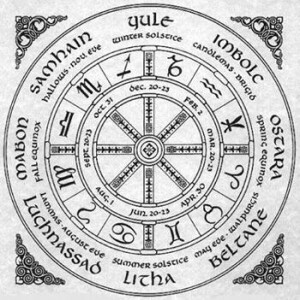 There are eight holy days that are celebrated in the religions of Witchcraft; these are known as the Sabbats. These days fall on the quarters and cross-quarters of the year, and are symbolic of the seasonal changes and the cycles of life itself. It is my opinion there were not that many Sabbats when Witchcraft first became a religion; the additional sabbats are a result of the religion’s global evolution. We must remember that Witchcraft is a nature-based religion, and therefore the changes in the seasons are highly significant. Through the use of stone calendars and observation of the skies from temple rooftops, the exact day of each seasonal change was determined and declared a holy day. These calendars and temples of our Pagan ancestors have withstood the test of time, and can still be seen today. Seasonal changes are the result of solar changes; therefore these four holidays are constant in all religions of Witchcraft. Some Witches refer to these holidays as the “Lesser Sabbats”, but I do not see how days that Nature itself has deemed sacred can be considered “lesser” than the other four sabbats. The so-called “Greater Sabbats” were created by mankind. A majority of their symbolism comes from the Celts. The Celts were a cattle-raising society, and the other four Sabbats mark the days of the birthing season, and the times when the herds are taken out to pasture and returned. These four Sabbats fall halfway between each solstice and equinox. The Sabbats of the Witches reflect two different cycles – the cycle of the seasons and the cycle of life. Because of the primitive belief in Animism, these two cycles intertwine heavily with each other in their symbolism, and over the ages, the seasonal changes became associated with the divine myth of death and resurrection. The solar cycle became symbolic of the life cycle of the God/King – every year he grows, loves and dies, only to be reborn again. In every society is found a cultural myth of resurrection. In the Egyptian society, Osiris is seen as the God of the Grain, The story of his life is reflected in the agricultural cycle of the sowing and the harvest. In some societies, the Goddess is the focal point of the resurrection myth. In the story of Ishtar’s descent, the Goddess travels to the Underworld to ask her sister, Ereshkigal, for the return of her dead lover, Tammuz. While Ishtar is there, the earth above lies barren and desolate until her return. A similar tale is that of Persephone – the difference lies in their willingness to go to the Underworld, and in their subsequent reactions. Ishtar went willingly, but chose to love life over death; Persephone, on the other hand, was taken to the Underworld against her will, only to fall in love with the very King of Death himself. In the Pagan year, there are three festivals of fertility and three festival that are dedicated to the harvest. I feel that this is because as agricultural societies grew, they recognized certain times of the year for the planting and the harvest. These times differed according to climate and geographical location, and were all eventually combined with the two solstices to create the Wheel of the Year that Witches recognize today. I have also noticed an underlying symbolism in the arrangement of these holidays, and often wondered if it was all some grand maneuver of the Collective Unconscious. When placed together, the fertility festivals each focus on a different plane of earthly existence. This same current is noticed in the progression of the harvest festivals as well, Imbolc is indicative of animal fertility, Spring Equinox celebrates the fertility of the vegetation, and Beltane ribbons are intertwined to represent the joining of the male and female. The energies of these three Sabbats culminate with the fiery passion of the Summer Solstice, and the harvest festivals begin. Animals born during Imbolc are weaned around the time of Lammas, we give thanks for the harvest on the Autumn Equinox, and the festival of Samhain can be viewed symbolically as the time of the harvest of human souls. The harvest Sabbats are followed by the Yule season; its long nights keep us “in utero” until Imbolc and the birth of Spring. The wheel of the year turns. This entry was posted in Articles and tagged god, goddess, holiday, sabbat, sabbats, seasonal myths, seasons, wheel, witch on May 3, 2013 by Michelle Griffin.